There's this thing that Mormon women do called Relief Society cookbooks. If you're not familiar with these, here's how it usually works. The women of the ward (or Relief Society) all pitch in a few of their favorite recipes and then someone compiles them into a book. You pay a few dollars to get a copy and then you have a huge book full of hamburger casserole and homemade oreo cookie recipes. I kid. The women of the ward I grew up in are amazing women. Many of them are my friend's moms and I ate their food many times. From picnic lunches made for us on a Saturday in the backyard when the weather was nice to snacks while playing ponies near the swamp cooler in the summer to breakfasts after a weekend sleepover. Delicious and generous. This recipe came from that cookbook but I don't remember whose it is. Let's just say, it's a keeper. Super fast and delicious. Perfect for a night like tonight when the air was chilly and my toes were being kept cozy in polka dot socks. In a medium to large pot, heat olive oil over medium heat. Add garlic, onions, cumin and chili powder. Saute for 3 minutes. Add the rest of ingredients and simmer for 20 minutes. Serve with sour cream, cheese, olives and avocado (give or take what you like). *I almost never have leftover chicken for something like this (which is really ideal because it's so easy). You could buy a rotisserie chicken and split it between this and another meal. However, I usually just thaw a couple of frozen chicken breasts, cut them into large chunks and saute it in a pan of a couple tablespoons of olive oil with salt and pepper, cumin and chili powder for about 5 minutes and then add it to the soup to finish cooking (doesn't need long or else it will be really tough). I think there should be a cookbook called "Lizzy's Yummy Morsels." Just think about it. 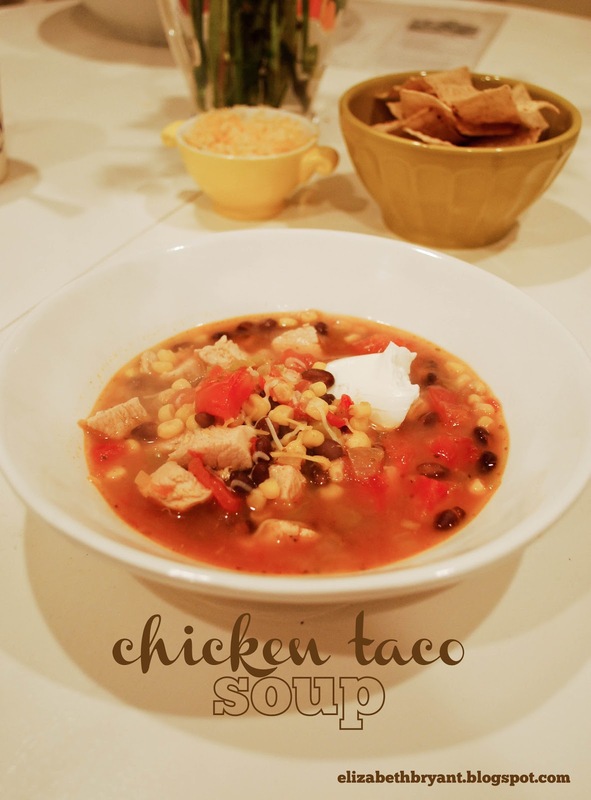 i just tried a recipe very similar to this but she called it chicken tortilla soup. the only thing that was different is that she added a can of enchilda sauce (and i added the black beans because i thought it would be better with it). This is PERFECT for dinner tonight! I was just thinking I wanted soup, but we all we really have is stuff for burritos. Thanks for sharing! Made it tonight for dinner. Simple and yummy. Will definitely make again. Thanks!